Origin of name  Rebecca Brewton Motte probably named the plantaion Eldorado because of the golden pitcher plants that grew in profusion there (3, p. 755). Another possible reason for the name was that Rebecca Brewton Motte's son-in-law, Thomas Pinckney, concluded a treaty between the United States and Spain, establishing the right of Americans to use the Mississippi River and the Port of New Orleans (3, p. 755). Current status  The land is part of the Santee Coastal Reserve managed by the SC Department of Natural Resources. Daniel McGregor received a grand for 500 acres that adjoined other property he owned (3, p. 755). 1724  Daniel McGregor's will left his property on the Santee River to son Daniel McGregor, Jr. (3, p. 755). 1764  Sampson Neyle purchased 550 acres from Daniel McGregor, Jr. Neyle put this property together with other adjacent property of his to form Washo Plantation (which would become Blake's Plantation) (3, p. 755). 1784  Rebecca Brewton Motte, of Mount Joseph Plantation, purchased 400 acres from the estate of Sampson Neyle (3, p. 755). 1797  Rebecca Brewton Motte and her son-in-law, Major-General Thomas Pinckney, Sr., designed and built the house (2, p. 126). Note: Thomas Pinckney first married Elizabeth Motte in 1779 then married her sister Frances in 1797 (6). 1815  Rebecca Motte's will was proved where she left Eldorado to her daughter Frances Pinckney then it was to pass to the children of one her other daughters, Elizabeth Pinckney (3, p. 759). 1819  Major-General Thomas Pinckney entertained Present James Monroe at Eldorado Plantation (5, V: 9). Prior to 1850  Charles Cotesworth Pinckney, son of Elizabeth and Thomas Pinckney, became owner of the plantation (3, p. 759).
?  During the Civil War, a Union steamer on the South Santee River shot at the plantation house and knocked out one of the brick arches of the raised basement (2, p. 218). 1865  Charles Cotesworth Pinckney died and left the plantation to son Thomas Pinckney. 1897  On May 10, a fire broke out in the chimney of the house. Archibald Hamilton Seabrook and his family were living in the house, that was still owned by Thomas Pinckney, at this time but they were unable to control the fire. The house burned completely to the basement (2, p. 287) (3, p. 759). The chimney apparently had been damaged in the 1886 earthquake but no one realized there was a crack. 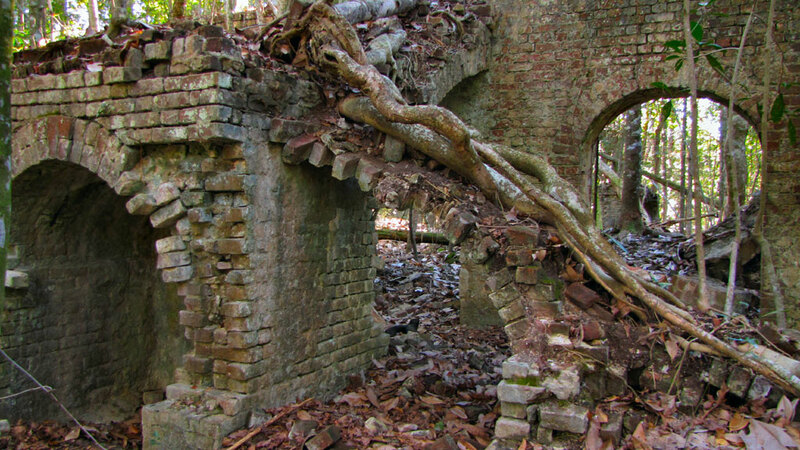 Ruins of the house can still be found in the woods (2, p. 311) (3, p. 759). 1900  The Seabrook family decided to move to Columbia. The rice crop was declining in the area because planters could not compete with the low costs of rice from Texas and Louisiana (2, p. 317). 1915  Josephine Pinckney, a noted writer and poet, inherited the plantation from her father, Thomas Pinckney (3, p. 759). 1957  Josephine Pinckney passed away and left Eldorado to her half-siblings (3, p. 759). Late 1950s  The Santee Gun Club purchased the property from Josephine Pinckney's half-siblings (3, p. 759). 1974  The Nature Conservancy purchased the property and gave it to the South Carolina Department of Natural Resources for the development of the Santee Coastal Reserve Wildlife Management Area (4). January 1854  Charles Cotesworth Pinckney had the following slaves confirmed by Bishop Davis: Isaac, Tony, Moses, Peter, Mary, Clarista, Flora, Guy, Camilla, Stephan (2, p. 437).